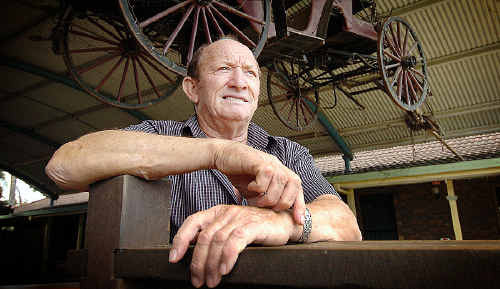 Norman McLean - father of world-renowned 'horse whisperer' Guy McLean. NORMAN McLean knows the trails around his Susan River Homestead property - he has ridden them too many times to count. Every twist, each turn and inclination he could navigate backwards while blinded by the sun. He has a way with horses too, as you may have guessed, given his last name - Norm's son is world-renowned 'horse whisperer' Guy McLean, the man who packs stadiums and arenas everywhere he goes. The Homestead is a location people visit from across Australia, and the globe. They come to learn about horses from one of the best and from his knowledgeable staff. Predictably, the horses are content on his farm, touring the property with visitors aboard their backs it is a life of leisure and they are never mistreated. Norm can call all 50 of them by name and he knows their nature as a father would his own children. When guests come to ride, their horses are hand-picked to suit their level of experience and confidence, and they are offered support for as long as they need it. "Every personality is different in a horse, just like with people," Norm said. "Our horses aren't runaway horses. "For the (riders) that have never ridden we instruct as we put them on - how to pick up the reins, where to put the legs, stay in a certain position all the time, how to pick up their horse before they want to go anywhere." It is Norm's passion that has led to him developing such an intimate understanding of the animal. It is a genuine love he developed as a child. If Norm ever has to sell a horse, he can never watch it leave - parting with them, for him, is always tough. Over the duration of a few hours spent riding trails at the Homestead, visitors more often than not begin to appreciate how Norm came to love horses. As they roam the open land, horse and rider form a special type of bond. They share an experience involving complete trust. The Susan River Homestead Adventure Resort runs horse riding for beginners to experienced riders, with a range of horses to suit each individual. There are a number of packages available. Visit susanriver.com or phone 0741216846.